Spicy Garlic Barbecued Pork Ribs | What's Cooking at the Genua's? Who doesn’t love barbecued ribs? Nobody that I know of! But when it comes to barbecuing them everyone tends to shy away because they “take so long”! No they don’t! Not how I do them anyway! For my recipe you do have to think ahead and marinate them overnight for the best results. You can also marinate them a few hours ahead of time, but overnight is best. I’ve searched and searched and watched and watched all the ways to have great barbecued ribs. The one recipe I found to be the best so far was from Ina Garten, The Barefoot Contessa. I tweaked her recipe to make it more Genua! These are also made to be cooked on a grill with charcoal. I’m sure they’ll be fine with a gas grill but we have charcoal. 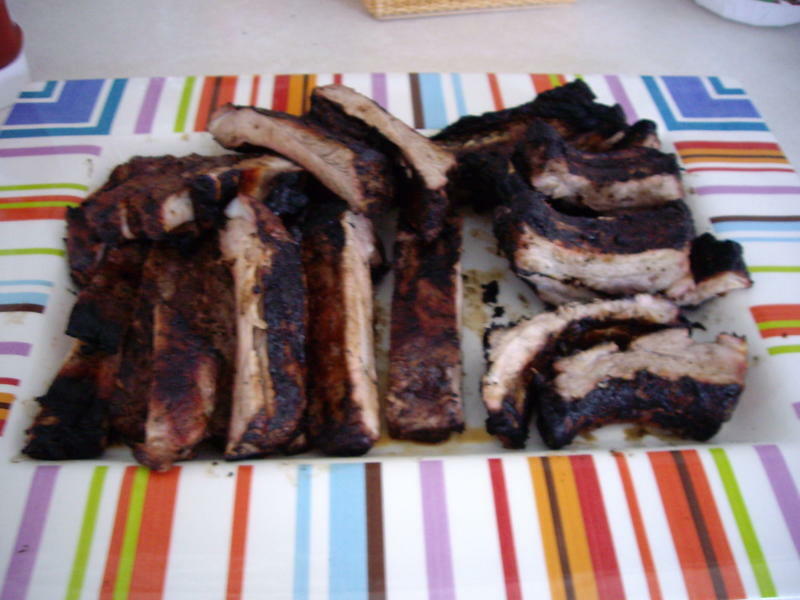 I also use either pork loin ribs or St. Louis Style ribs as we love to have meaty ribs! Don’t be scared by the amount of ingredients either. It’s not so bad. I am the first one to skip making a recipe because of the amount of ingredients! Remember it’s all for the marinade/sauce! 1. Heat the vegetable or olive oil in a large saucepan over medium-low heat. Saute the onions and garlic for 5-7 minutes, until the onions are translucent but not browned. 2. Add the chili powder, ground cumin and red pepper flakes and continue to cook for 1 minute. Add the zest and ginger and cook for an extra minute. 3. Add the vinegar, tomato paste, honey, mustard, soy sauce and orange juice and simmer uncovered on low heat for 15 minutes, until thick. Stirring occasionally. 4. Marinate the ribs in 2/3 of the sauce for a few hours or overnight in the refrigerator. 5. When you are ready to grill prepare the grill with a single layer of hot coals and then add a few more coals 5 minutes before cooking, which will keep the fire going longer. Place the ribs on the grill and cook for about 25-30 minutes, turning once or twice to cook evenly on both sides. Brush with marinade as needed. 6. Check the ribs after 30 minutes. If they are still not ready (thicker ribs may take longer) just cook for another 5-10 minutes. Check to make sure they are to your liking. EAT!! Pingback: Pumpkin Mac & Cheese « What's Cooking at the Genua's?